The put credit spread option strategy is a bullish, neutral, and minimally bearish options trading strategy with a limited potential profit and loss. Essentially, the strategy involves selling a put option while simultaneously buying a put option further away from the short put. The put credit spread often referred to as a “bull put spread.” Put credit spreads are a great way to sell option premium and avoid a potentially catastrophic loss that is a constant risk with short options. Out of every online broker with 24/7 customer service in 2018, Ally Invest the has the lowest commissions to trade the put credit spread strategy as well as the best free options trading software. Read the Ally Invest Review. Note: like most options spread strategies, put credit spreads can be traded in-the-money (ITM) or out-of-the-money (OTM). Most commonly, put credit spreads are traded at-the-money (ATM) and OTM. By doing this, the trade would create a net credit of $0.30 ($30). This is why this strategy is called a “credit” spread. If stock XYZ rallies, the put credit spread will decrease in value and result in a profit. Conversely, if XYZ sells-off, the put credit spread will increase in value and result in a loss. As expiration nears, credit spreads will benefit from theta decay unless they are completely in-the-money. For the example trade above, the max profit is $0.30 ($30). The max loss is $1.70 ($170). 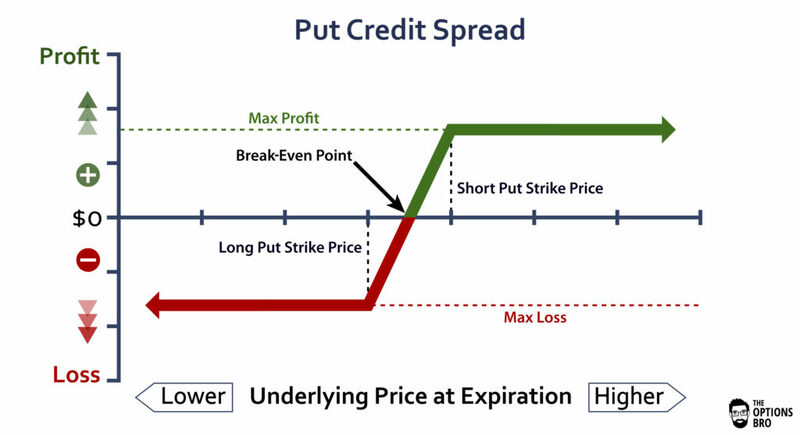 A put credit spread would be a complete losing trade if, at expiration, both legs of the spread expired in-the-money. If XYZ stays above $48 at expiration (the strike price of the short put) then the put credit spread will be a full winner. You can calculate the break-even point for a put credit spread by simply subtracting the max loss from the short put. In the case of XYZ, the break-even point is $47.30. Why Trade Put Credit Spreads? Because put credit spreads can be profitable with any of these three market outcomes, they are very popular trades to make. Although the short put has a similar profit structure, the short put carries an inherently large potential loss, and the put credit spread does not. A put credit spread that is initiated OTM has an increased probability of expiring worthless. Because of this, the potential profit is always less than the potential loss for OTM credit spreads. Credit spreads that are at-the-money typically have a 1:1 profit/loss ratio where the max loss will be similar or equal to the max profit; at the time the trade is placed, there’s a 50/50 chance of profit/loss. Theta decay works in favor of a put credit spread. 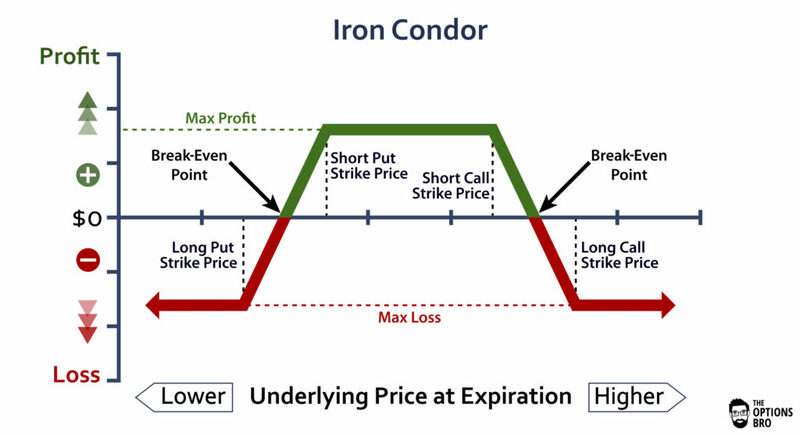 Everyday, premium will be systematically priced out of the short option leg of the spread. Although premium will also come out of the long option leg of the spread, the premium that comes out of the short option leg will be greater and thereby offset the long option theta. When Should I Close a Put Credit Spread? If a put credit spread has reached its max profit, it should be closed out prior to expiration. The best practice for a profitable put credit spread is to only close out the short put, and leave the long put (which will likely be completely worthless) untouched. Because the short put has no more room left to decay, it makes sense to close it out, because it has reached its max profit potential. The long, however, can only go up in value, so it is a freeride. Similarly, if a put credit spread has reached its max loss, it should be left alone, because there is always the possibility of the market moving in favor of the position. Yes. The risk with all vertical credit spreads is the underlying asset expiring within the short and long strikes. Of course, the expiration risk depends on the settlement procedures of the asset that you are trading. If the asset is cash settled, like the SPX, there is nothing to worry about. Typically the only instruments that are cash settled are stock indices and futures, like the SPX and ES, respectively. 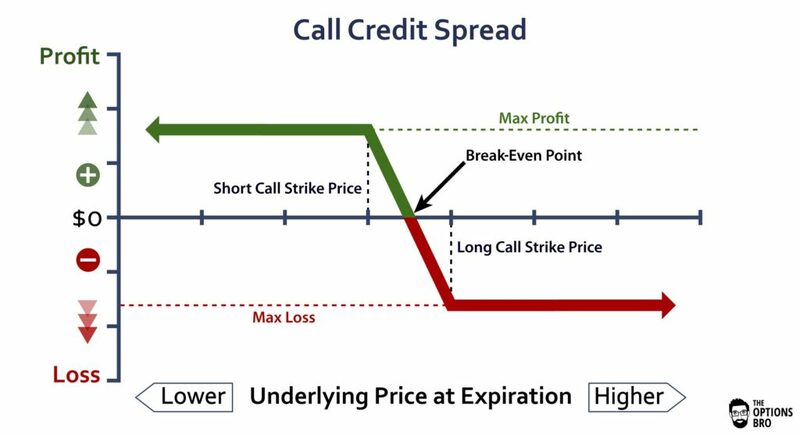 If you’re selling put credit spreads on individual stocks, there is an added expiration risk of the short strike expiring in the money and the long strike expiring worthless. If this happens, you will be long 100 shares of stock for every short put. This is generally not a problem if there is enough buying power in the account to hold the position. If there is not enough buying power, a margin call could be issued. It is common practice for options brokers to reach out clients who have expiring options positions to notify them if a position will have a negative margin impact. All expiration risk can be easily avoided with proper account monitoring. The put credit spread option strategy effectively presents a risk-defined way to sell put option premium, which is nice. Traders can use put credit spreads to take a bullish position or slightly neutral position (even minimally bearish), all while benefiting from selling option premium. Essentially, trading put credit spreads is very similar to the short put strategy, but without the added risk. Selling short puts is one of the most common ways to sell premium, but the trade is inherently risky. If the underlying asset crashed, short puts (especially if uncovered) would be a horrible losing trade. However, the max loss for a put credit spread is always defined. Plus, like all vertical spreads, the put credit spread is not sensitive to changes in volatility. This means that implied volatility can explode and the position will not lose money as a result. Of course, this is a double-edged sword because you will not benefit from a volatility crush like you would with a short put. If you’re looking for a relatively lower-risk way to express a bullish, neutral, or minimally bearish outlook on any optionable underlying asset, try using the put credit spread option strategy. Ally Invest is the cheapest broker to trade put credit spreads. Up to $3,500 cash bonus + commission free trades for new accounts.